Disclaimer: the comments and opinions expressed in this review are the results of our own (limited!) experience with the product. As always, we try to provide context to give a fair overview of the product. We strive to remain impartial and unbiased, and we have not received any payment or compensation of any form for writing this article. 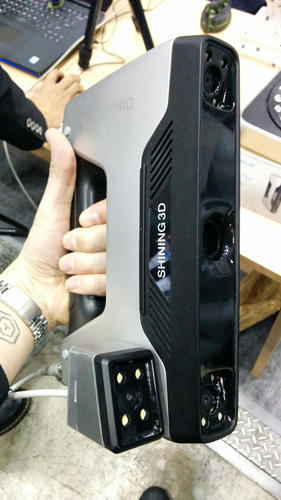 We have tested the Shining 3D EinScan-Pro during the Tokyo 3D Printing Show in 2016. You might not know this company yet, but Shining 3D is the #1 company on the Chinese stock exchange, for the 3D digitizing and 3D printing industry. Shining 3D was founded in 2004 and got listed on the stock market on August 8, 2014. The company’s headquarter is located in Hangzhou and there are branches in Shanghai, Beijing, Nanjing, Guangzhou, Chengdu, and several other major Chinese cities. If you’ve heard about them already, it might be thanks to their Einstart-S or Einstart-L 3D printers or the recently introduced Einscan-S desktop 3D scanner. Indeed, Shining 3D boasts an impressive lineup of products, including industrial 3D printers and scanners. Their latest release is the Einscan-Pro: a mid-range handheld 3D scanner, designed for professional use. Introduced at CES 2016 in Las Vegas, this new addition to their portfolio was also showcased at the 3D Printing 2016 in Tokyo. We were at the Tokyo Big Sight event two weeks ago and we got the opportunity to test and try the new EinScan-Pro. Our feedback in one word: amazing. 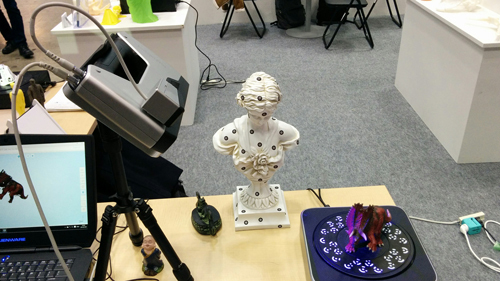 This 3D scanner is based on a structured white light scan technology. It is capable of producing detailed scans in several different modes: Handheld HD scan, Handheld Rapid Scan, Automatic Scan and Free Scan. The maximum scan accuracy can go up to 0.05 mm on a single scan with a specific configuration (Industrial package). Here are two useful links for more detailed characteristics: summarized performance review of the EinScan-Pro, for 3D scan samples by the EinScan-Pro. The EinScan-Pro is light (only 0.8 kg) and is available in several versions. The Basic package does not capture textures but costs only $4,000. Two upgrades are available, each for $700: the Color package which adds colors/texture capturing capabilities through a small side module (see picture above), and the Industrial package which adds an automatic turntable and a tripod to the package. Both bundles (Color and Industrial) can be combined for $1,400: a fully equipped Shining 3D EinScan-Pro costs $5,400. It is important to note that the price tag is far below those of direct competitors (Artec Eva or Creaform Go!Scan for examples). I first was able to witness several free scan use case on a small statue (equipped with markers) and later on with a wood panel. Both results were really good and quite fast to produce. I also tested myself the scanner using this free scan mode. The EinScan-Pro is nice to hold and comfortable to operate. The software is fairly easy to use and provides a great user experience, for instance by automatically stitching the different 3D scans automatically to produce the final scan. The Shining 3D team then performed a 3D scan with me as the subject. 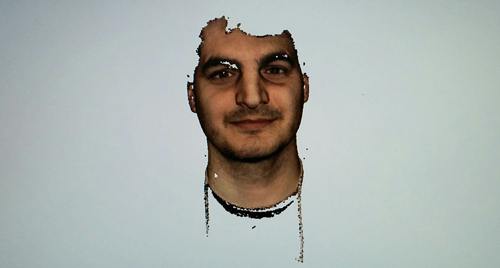 In less than 2 minutes, a high-resolution scan of my face with textures was available. Note that The EinScan-Pro, like all ‘affordable’ structured light 3D scanners, have a very hard time dealing with hair. 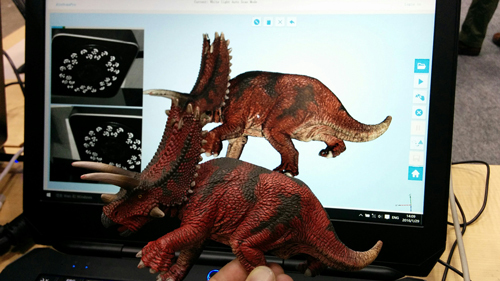 The Einscan-Pro mounted on its tripod, performing a 3D scan of a triceratops (on the turntable). My last test was performed on a small triceratops glossy plastic figurine. It only took two automated 3D scans to generate a great 3D model. The stitching and merging of the dots cloud and the generation of the textured polygons was quick and entirely automatic. One thing to keep in mind: like almost all structured light 3D scanners, the Einscan-Pro is not suitable for outdoor operations at it is affected by intense sources of light. The Shining 3D EinScan-Pro is a powerful and versatile portable 3D scanner offering among the best price to performance ratio of the market. It is certainly one of the most promising handheld 3D scanners of 2016. It offers an amazing level of performance at a very reasonable price, as it’s roughly three to four times cheaper than its closest competitors. The software is efficient and easy to use. For small to medium size companies looking to invest in a 3D scanning solution, we think it’s a very interesting option to consider. 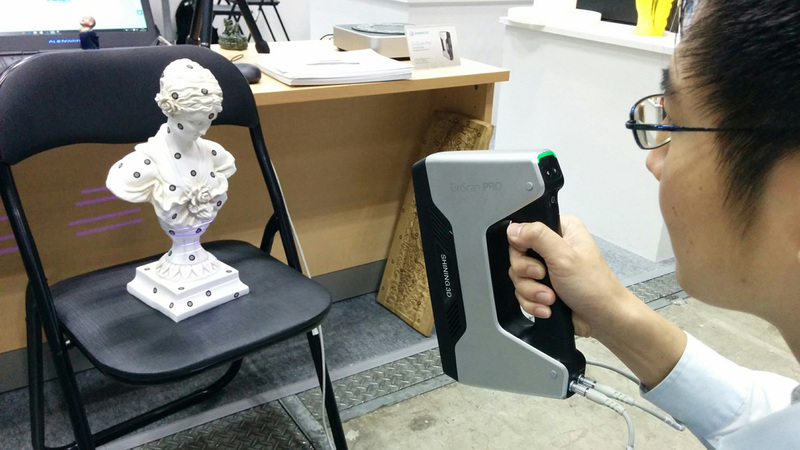 The best uses cases for this portable 3D scanner are museum conservationism or design studios. We do not recommend it for full body 3D scanning, even if it gives good results for face 3D scanning.